PhotoDay......Jim Scolman: Up & Over! Cedar Crest High School pole vaulter, Junior, Kyle Hamilton soars 13 feet to win the pole vault event in the 4 way, co-ed Track and Field Meet, Thursday, 3/30/2006 at the Sultan High School Athletic Center. Hamilton's PR, personal record, is 14 feet. 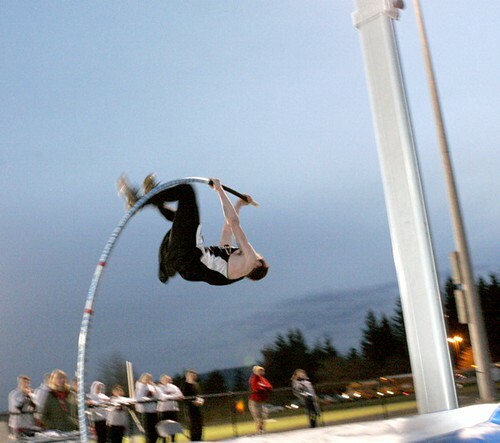 The evening turned dark and cool as he made 3 attempts at a new PR of 14 feet 2 inches. A vaulter is allowed 3 tries at each height. The winning vaulter can set the bar at any height after winning the event to try for a personal best.